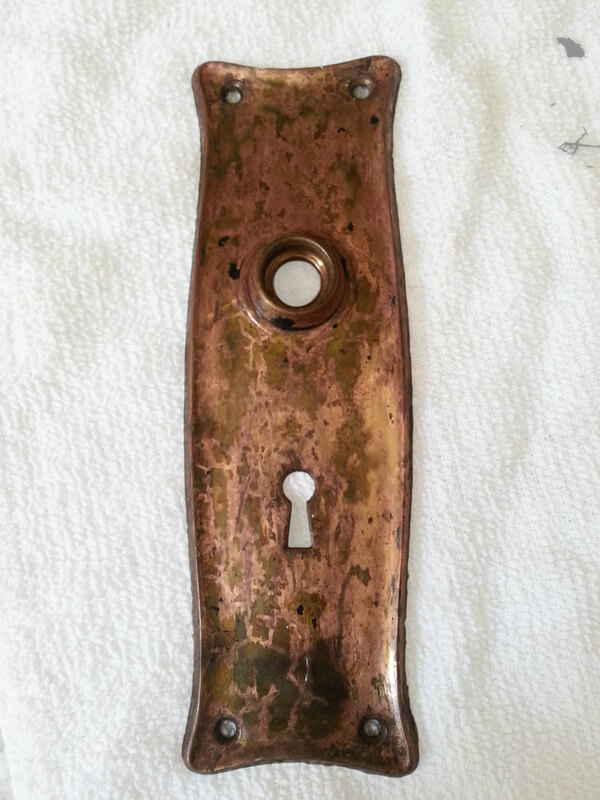 Some of the few original details our Victorian still has are the doors and door hardware. 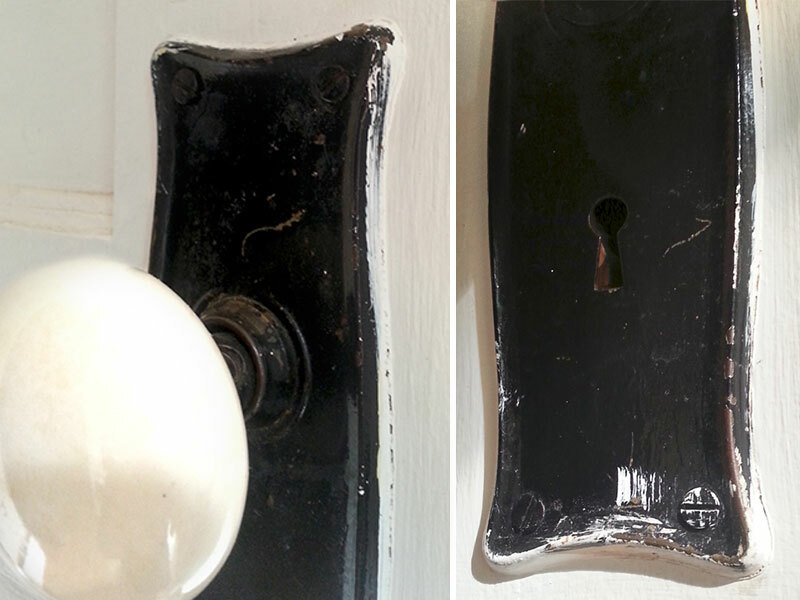 But the door knob plates (I’m sure there’s some proper term for them) in the mud room/hallway/weird spot looked pretty bad. The doors had been painted several times and the painters didn’t bother trying to keep it off the plates. After they soaked, the paint flaked right off. It seemed to be spray paint too, which makes it even more impressive. 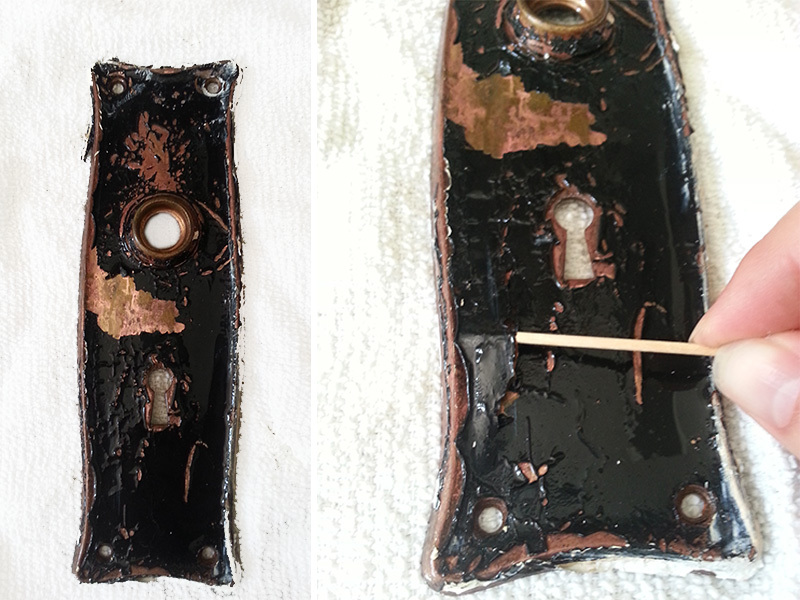 I was pretty excited about restoring them down to the original brass, even if it did look worn (I love that look). But unfortunately, once the paint was off, it wasn’t so pretty. They all 4 looked the same. Replating, or even replacing isn’t in the budget right now, so since those were the only decent options, I didn’t feel bad spray painting them. 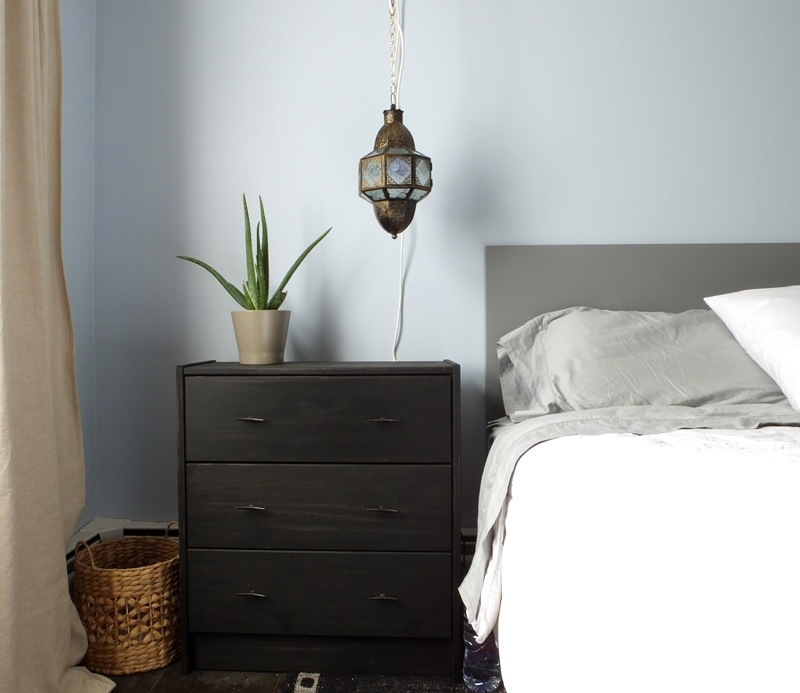 I actually liked the black look anyway–not as much as I would have liked the original brass–but the black looks good with the white porcelain knobs. For some context of the area this is, the picture was taken from the kitchen. 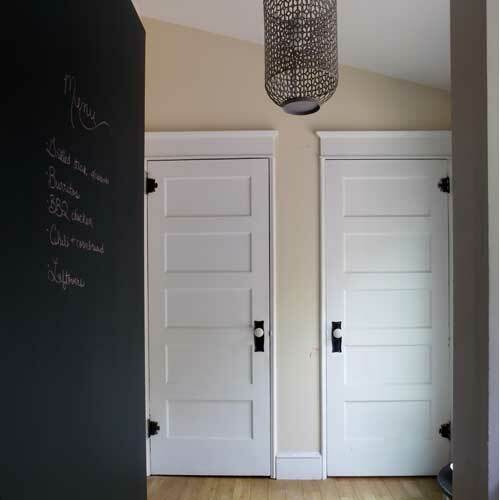 The pantry is the door on the left and the powder room is on the right. Next for this room is painting the walls. Once I do that, I’ll share some tips (thanks again to Dad) on how to properly paint over a semi-gloss finish. It might not be ideal, but they still look really great; far better than they did before or after the paint removal! A quality spray paint job makes all the difference, too. Oh, that is definitely much better looking than before! What a little vinegar can do… 😉 and such exciting news to read you’re moving!! I’m curious to read where you will move to! Ooh, good to know. 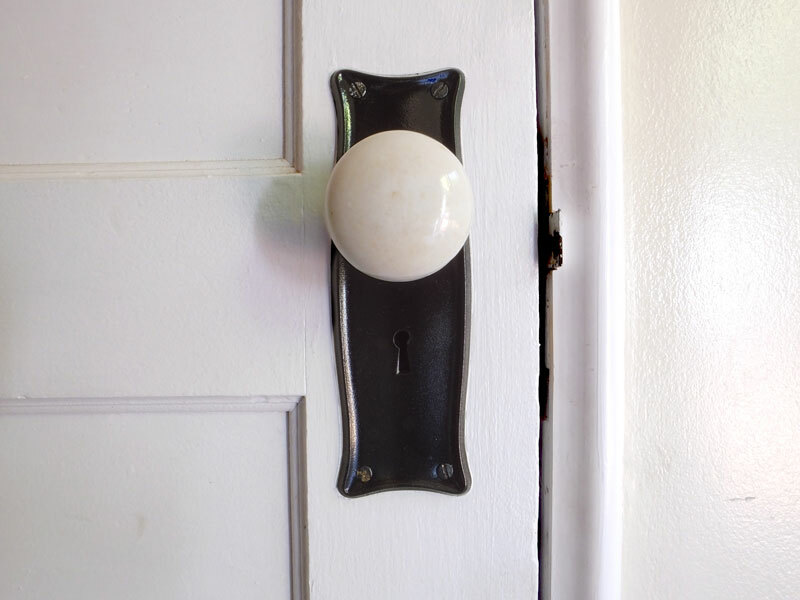 We have a million painted-over doorknobs and hinges that I want to get to someday. I’m glad to know that I shouldn’t waste my time with the crockpot method. I was never really into the idea of putting old paint in my crockpot anyway! 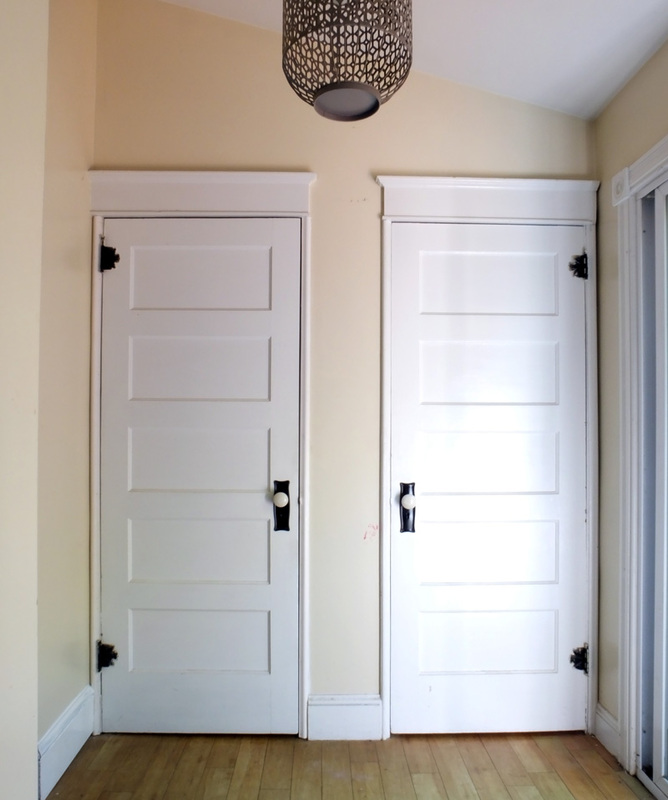 Your doors look great! I like the black and white. I didn’t know that vinegar trick, but I’ll try it!